I wanted to accomplish two three things this weekend: watch the Mad Men finale, make stuffed cabbage, and use up odds and ends in the fridge. Today, I’m three for three! 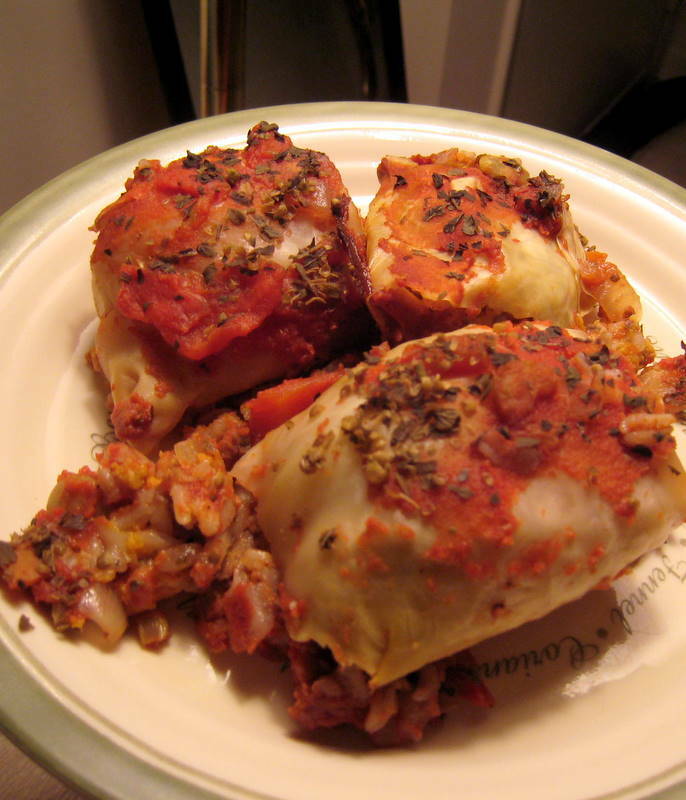 Smitten Kitchen’s recipe for Alex’s mom’s stuffed cabbage looked easy enough, and simple to veganize. The trick was to also use up some wayward mushrooms, leftover sweet potato burgers,and some very old wine. And, half a head of cabbage. Now, behold, the stuffed cabbage casserole. Cut the core out of the cabbage but leave it whole. Boil water in a small pot, then remove from heat and let the cabbage sit in the pot for 10 minutes or so. Heat the oil in a saute pan. Cook the onions, carrot, and celery until they are also soft. 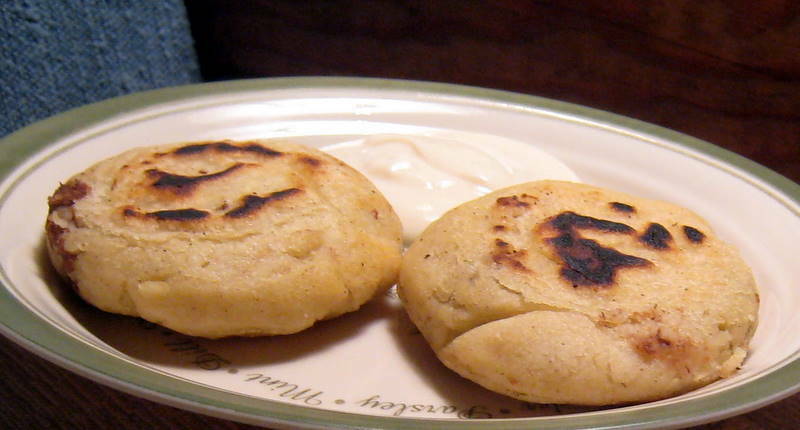 Season the mixture with salt and pepper, add sweet potato burger, limas, and mushrooms. 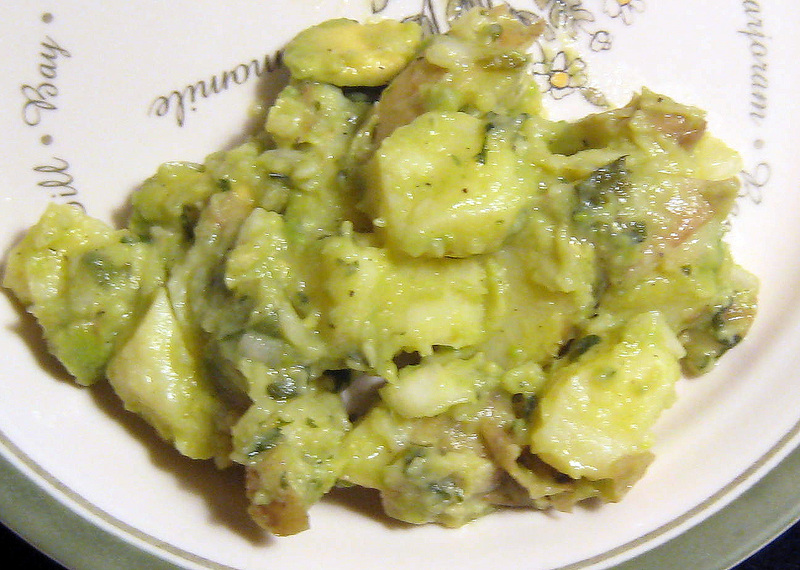 Cook until mushrooms release juices. Add rice and ketchup, then remove from heat. Drain the head of cabbage. Pull off large leaves, cut out the large vein — if the leaf is very large, you can make two rolls from each, if it is smaller, you can cut the vein out partially and pull the sides to overlap before you roll it into one roll. Pat the leaves dry with towels. Roll about some filling in each leaf (depending on the size of your leaf) and arrange in a 9 x 13 baking dish. 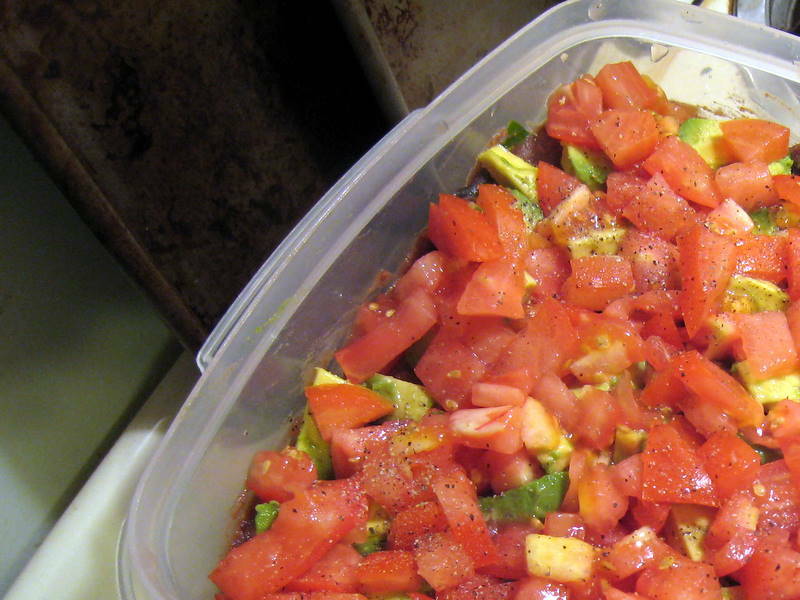 If you run out of leaves, just add the extra filling to the baking dish. Cover the rolls in sauce. 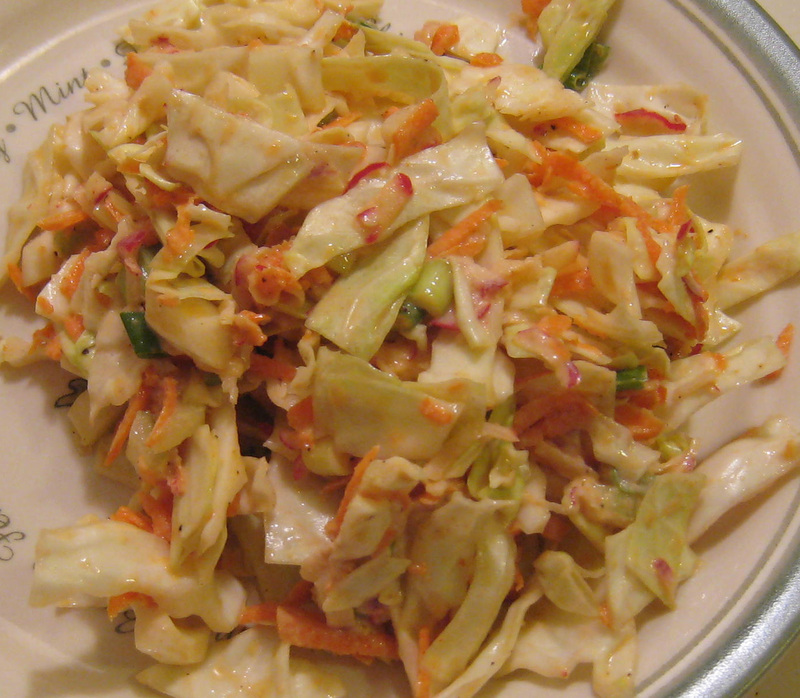 Bake about 45 minutes, or under cabbage is tender. Saute onion and garlic, add cumin, oregano, chili powder, cayenne, lemon juice, and nutritional yeast, and 1 TBL tomato paste. Season with salt and pepper. Add 1 cup of red lentils and 3 cups of water. 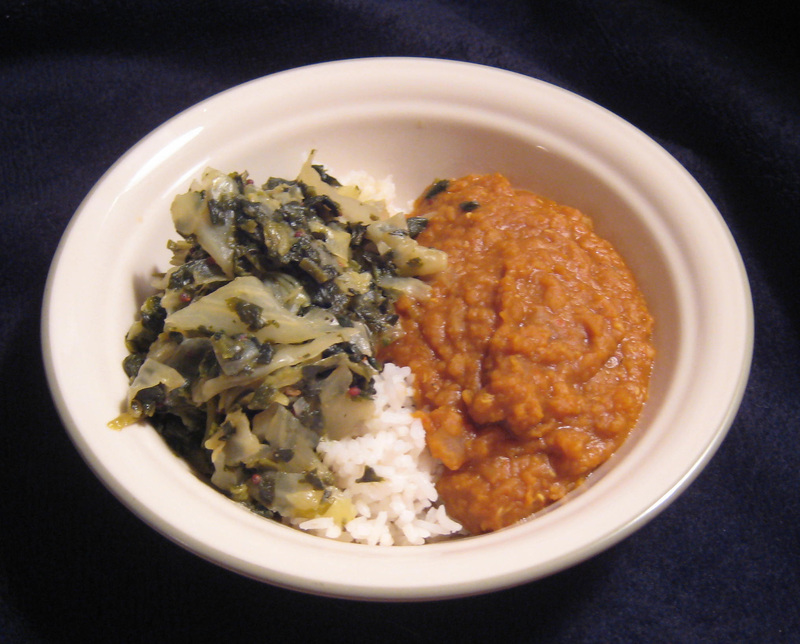 Cook until lentils are soft and the water is absorbed. 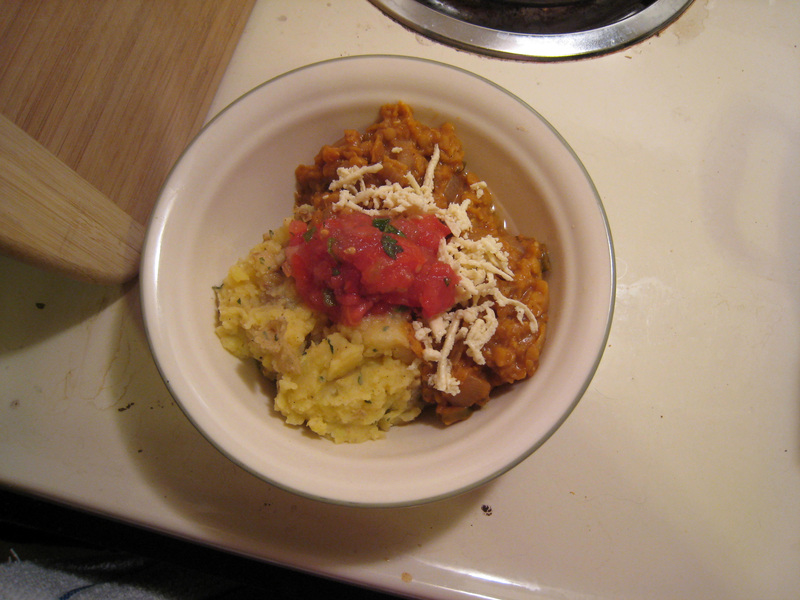 The mashed potatoes are just delicious vegan mashed potatoes with some parsley, topped with pico de gallo and Daiya mozzerella. Edit 3/8/2012: Did you know this is the most popular post on the entire blog? Leave a comment and tell us why you like it! And check out our moo shu rolls and fried rice. Happy cooking! 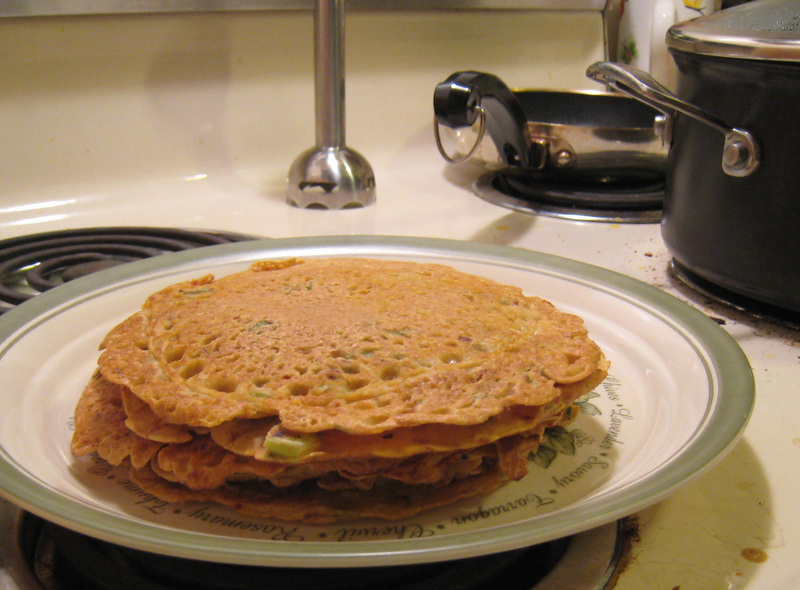 We didn’t get enough of the chickpea crepes last night, thus we schemed to make chickpea SCALLION crepes today. What goes with scallion pancakes? No necessarily moo shu, but in our case yes, definitely moo shu. This recipe is much lighter in oil and sugar than what you may have eaten in restaurants before. Also, no eggs, which is great for vegans and people who just don’t like eggs. Voila. We used this tasty recipe from Eating Well, but we added enough other items that I’ll repost it here (with our changes). This also includes a link to a very tasty homemade hoisin sauce. It takes five minutes to make, and it’s worlds better than the store bought sugary stuff. Heat 1 teaspoon oil in a large nonstick skillet over medium heat. Add mushrooms cook 2-3 minutes until mushrooms release their juices and are slightly seared. Set mushrooms aside. Heat remaining oil over medium heat. Add ginger and garlic and cook, stirring, until softened and fragrant, 1 minute. 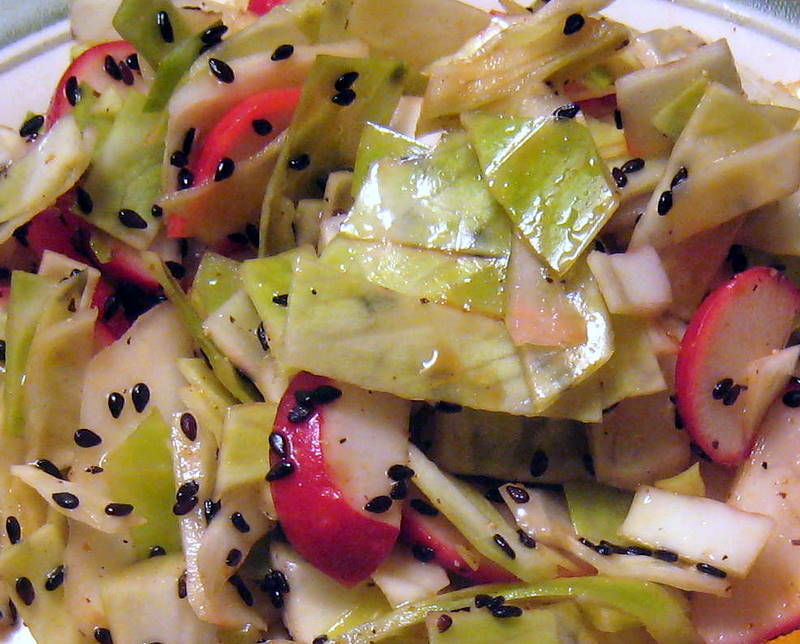 Add shredded vegetables, bean sprouts, half the sliced scallions, soy sauce and vinegar. Stir to combine. 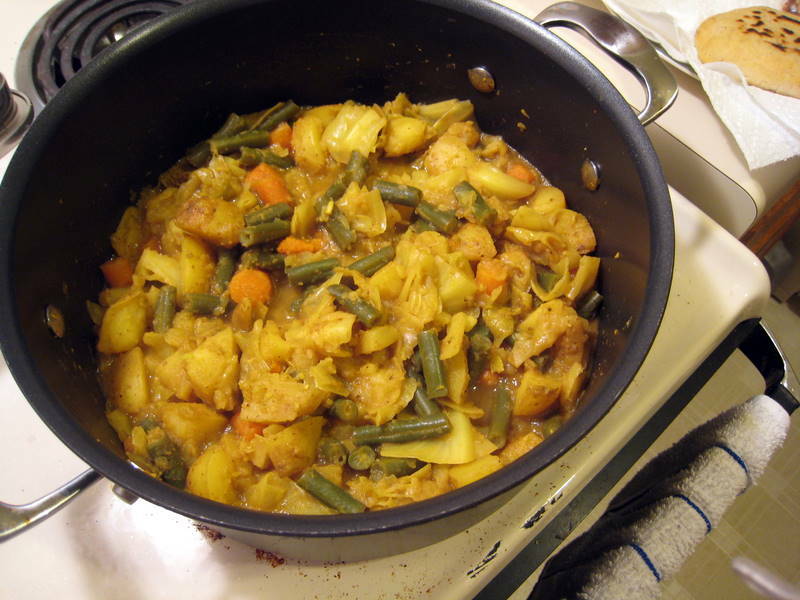 Cover and cook, stirring once or twice, until the vegetables are just tender, about 3 minutes. 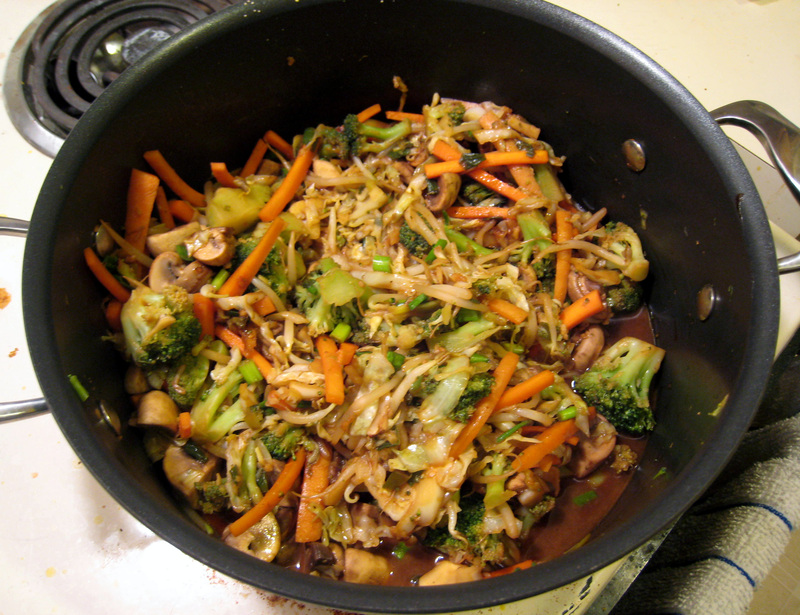 Add the hoisin sauce and mushrooms; cook, uncovered, stirring, until heated through, 1 to 2 minutes. Stir in the remaining scallions and remove from the heat. Mix together 1 cup of chickpea flour with 1.25 cups water until the batter is smooth. This will probably require you to use your hands to get out the lumps. Stef valiantly does this! Then add 5 finely diced scallions, 1/4 tsp salt, 1.5 tsp cayenne, 1.5 tsp red pepper flakes, mix well. Heat 1/2 tsp sesame oil in a small frying pan until the oil streams quickly. Whisk the batter, then pour 1/4 cup of the batter into the pan so that it covers the bottom completely. Allow to cook about 1.5 minutes, or until the top has stopped bubbling. Flip over and cook another 1.5-2 minutes, or until done. Add a little sesame oil before each new pancake, and give the batter a quick stir before measuring out the next batch. 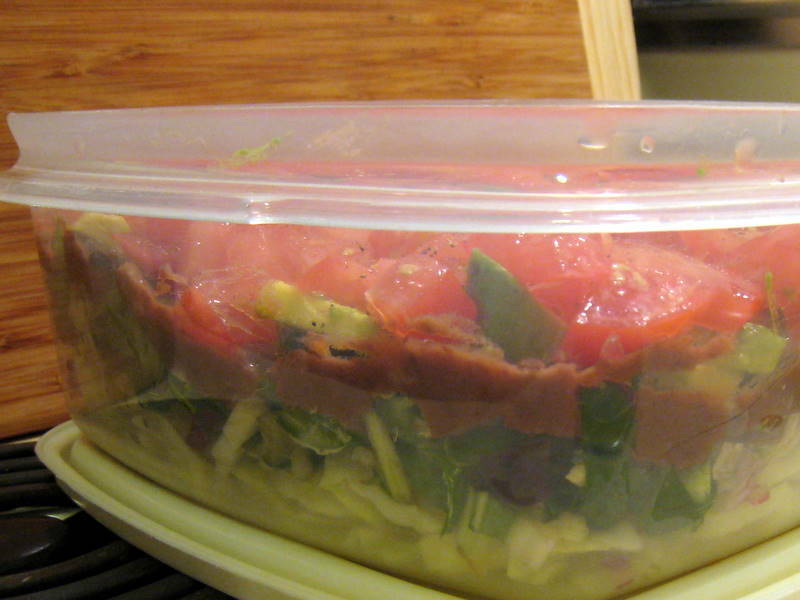 From bottom to top: cabbage, chard, shallots, tahini dressing**, jalapenos, refried black beans, avocado, tomatoes. **To make the dressing, mix together 2 TBL tahini with 1/2 TBL water until it forms a smooth, thick paste. Add the juice of one lime, 2 TBL cilantro, 1/2 tsp garlic powder, and 1 TBL white vinegar. Add salt and pepper to taste. Add more vinegar if you need more zing.